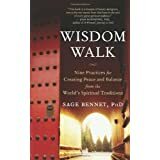 Wisdom Walk: Nine Practices for Creating Peace and Balance from the World's Spiritual Traditions ReviewDr. Sage Bennet's book has caught my heart and mind. She focuses on what is essential in each major religious tradition: in Christianity it's 'Forgive yourself and others', in Judaism it's 'Make time for the Sabbath', in Native American Spirituality it's, 'Let nature be your teacher', etc. The last chapter talks about what is common to all spiritual traditions, which is, 'Offer yourself in service to others'. HOW BEAUTIFUL! I find this book so inspiring and uplifting and also very practical. The author talks about her own struggles with relationships and addiction and religion and how these practices helped her personally. It's all very real and down to earth. Want to learn more information about Wisdom Walk: Nine Practices for Creating Peace and Balance from the World's Spiritual Traditions?